Many of the new mesh router systems self-update their firmware (router operating system). While this is a big step forward from the bad old days, where the task fell to the router owner, it's only a first step. On my Router Security site, I go into the difference between self-updating firmware done right and done wrong. With that in mind, here is what went wrong when my Google Wifi router updated its firmware. My first gripe is that the software update was a surprise. There was no warning ahead of time, either that an update was available, or that it was about to be installed. In contrast, the Eero app tells you that a firmware update is available well before the update is automatically installed. 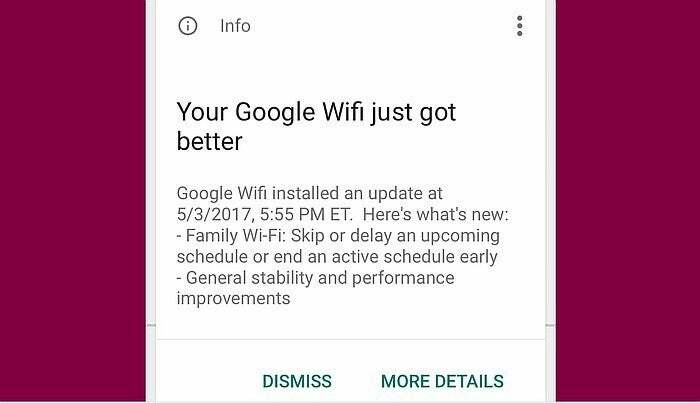 The screen shot below shows the Google iOS app informing me after the fact that it had updated the router software (the screen shot was taken May 6th). This is made worse by the fact that I explicitly asked to be notified. 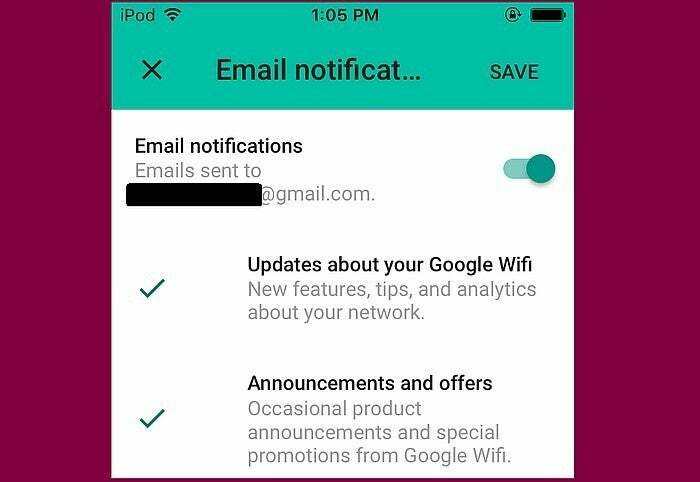 The screen shot below, of the Google Wifi iOS app, (version 2.2.8) shows that I had opted in to all their email notices. I should be notified about updates, new features and product announcements. Yet, when push came to shove, no email. Then there is the timing. The software update was installed at 5:55PM. Since Google does not offer the router owner a choice as to when the update happens, they should default to running the update in the middle of the night. 5:55PM seems like a really bad default time of day. Others have griped about this too; one complaint was that "Google Wifi just rebooted in the middle of my workday while on a VoIP call." Shades of Windows 10. The iOS app is also buggy. More than two days after the firmware update, the app reported that the router was running version 9202.35.8, released back in March. It wasn't until later in the day, that the app correctly reported that the software was version 9334.41.3. What's new in this firmware release? None of your business. The link in the app to "MORE DETAILS" (at the bottom of the first screen shot above) is a scam. There are no more details, just a generic list of tech support articles. The two sentences in this screen shot are the only available documentation. Three days after the router was updated, I could not find any documentation on the web. At support.google.com, I searched for "9334.41.3" and the only result was an article about the prior version of the software. 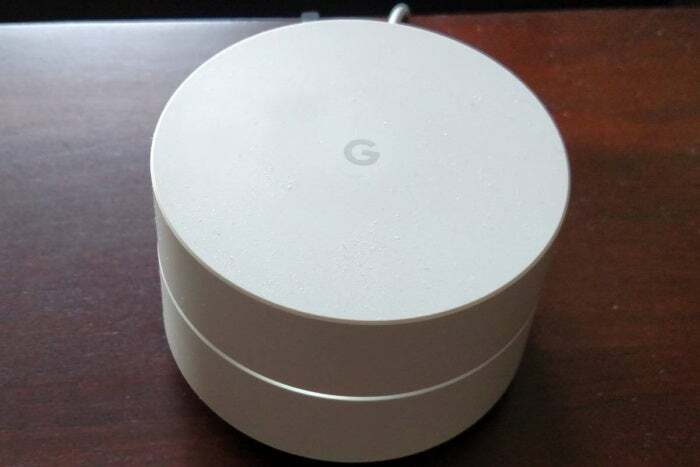 The search picked up that page because it has an index of related pages that included this one: Google Wifi & OnHub Software Version 9334.41.3. But that page is not firmware documentation, it merely details open source licenses. Taking a step back, searching for firmware documentation should not be necessary. Every router vendor should have a single web page with a firmware update history that we can bookmark. For Eero routers, the page eero Software Release Notes is exactly this. At the main product page for the Netgear Orbi RBK50, if you click on Firmware and Software Downloads, then on View Previous Versions, you can see the firmware history. My final gripe is about one of the two sentences that serves as release notes. That the update contains "General stability and performance improvements" is, frankly, insulting. In fairness, this seems to be an industry norm. The last three firmware releases for Eero all contained "Various bug fixes and reliability improvements." Netgear does the same; each of the last three Orbi firmware releases "Fixes bugs and security issues." These mesh router systems are consumer devices and that seems to imply that the customer has no right to know what's going on. Maybe these companies don't think their customers care. Maybe they don't think their customers can understand technical issues. Maybe the companies are just lazy. Maybe they don't want to air their dirty laundry in public. Their refusing to come clean about bugs stands in stark contrast with the behavior of Peplink, my preferred router vendor. Take, for example, the release notes for version 6.3.3 of the firmware for my favorite router, their Surf SOHO. Version 6.3.3 was the end of the line for version 6, and, as such, it was mostly a bug fix release. The Resolved Issues section lists seven fixed bugs, each of which has a tracking number. The Known Issues section documents problems that are not yet fixed. No one expects software to be perfect. Peplink comes clean and that's the best way to earn trust. From a Defensive Computing perspective, trust matters more than Wi-Fi speed and range. UPDATE May 23, 2017. The link in the app for MORE DETAILS (first screen shot above) now takes you a description of the firmware update rather than a list of generic support questions. However, there are no more actual details, it just repeats the same two sentences in the screen shot above. Get in touch with me privately by email at my full name at Gmail. Public comments can be directed to me on twitter at @defensivecomput.